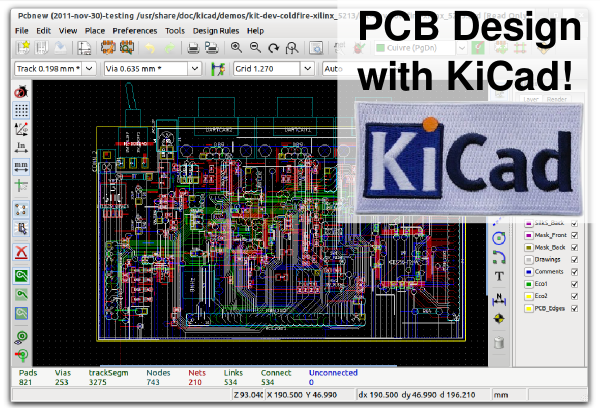 Take a KiCad Class, Earn a KiCad Skill Badge « Adafruit Industries – Makers, hackers, artists, designers and engineers! Matthew Beckler (one half of the great Wayne & Layne duo) taught a KiCad class on Saturday at the HackPittsburgh maker space. The multi-part class will teach the participants how to design a physical circuit prototype on a breadboard, translating the breadboard design into KiCad, ordering the PCBs through a quick-turn PCB manufacturer, and then soldering up their own boards. At the end of the class, the participants will take home their own, completed circuit boards, and an official KiCad skill badge. This sounds like a really great class, and we love to see our skill badges being put to use. If you live in the Pittsburgh area and are kicking yourself for missing the class, check out the HackPittsburgh website here, and hopefully Matthew will run another KiCad class in the future. Check out all of our Skill Badges here (including the KiCad version above). Hey there, thanks for the great writeup! The class was a tremendous success, and everyone had a great time while designing their own PCBs. Everyone loved the badges (as they always do), and we’re definitely going to be running the class again in a few months! I wish there were a hackerspace nearby me. I’d love to teach a similar class on KiCad. Scratch my previous comment. Looks like the Hackserspace up in Charleston (Makelab Charleston) came to fruition while I was overseas. I think I’ll contact them about teaching a class or two. Absolutely loved the class. A big thanks bud Matt !